Photographer Cameron Ingalls sent me a sneak peak of this wedding the day after the wedding thinking I might love it. Oh course I did and couldn’t wait to see more photos from the day! With the perfect yummy light, the bride’s dreamy style and the amazing location, this wedding is quite stunning! From Cameron, Adam and Marisa’s love story was a cross between Braveheart and The Band. All except they met at Cal Poly in a landscape architecture class and didn’t ride their horse off into the sunset across Scotland. But who’s comparing? Adam and Marisa are actually dear friend of mine that I have had the pleasure of watching their romance unfold from the beginning. Both Adam and Marisa have grown so much through their college years as has their love for one another. Those who know them well, know that they balance each other beautifully. It has been fun to hear their wedding plans and dreams over the months that preceded their event. 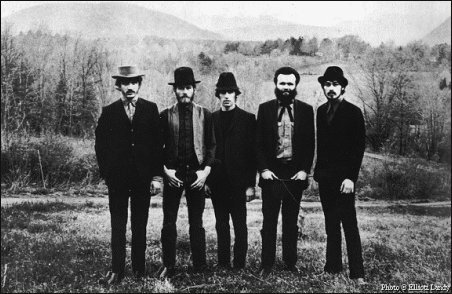 Adam wanted for his groomsmen to look rough and rugged like The Band. Marisa wanted them to look a little on the sharper side, so a shave and haircut was in order. 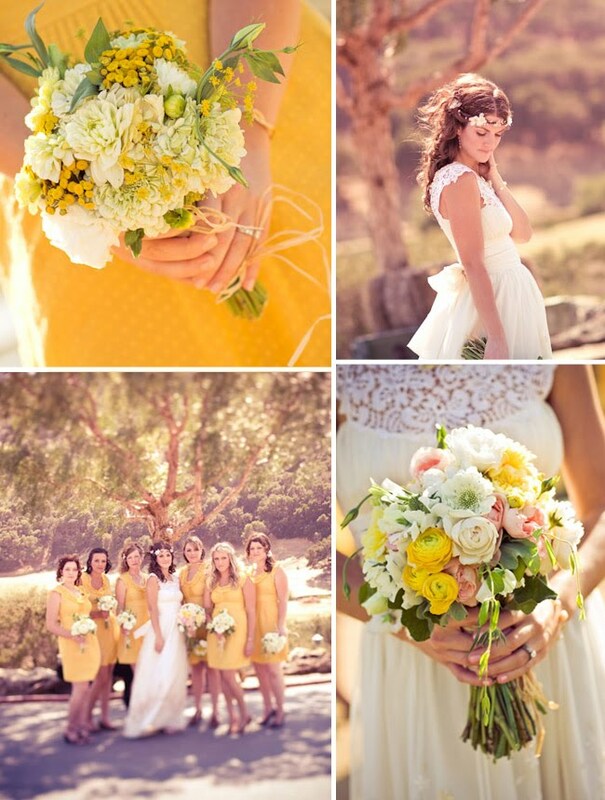 Her dress, her hair, the flowers, the perfect shade of yellow bridesmaids dresses – everything is so dreamy! Sunnie Brook styled both Adam and Marisa’s hair. Because they love hiking and camping so much Holland Ranch was just the perfect setting for their nature-themed wedding. Marisa’s dress was from Claire Pettibone in Beverly Hills. She bought her headpiece from which goose on etsy. A good friend Lindsey Hume triple-featured as a bridesmaid, guitar player/singer and the florist. DJ Malik Miko kept the sweet tunes flowing well into the night. 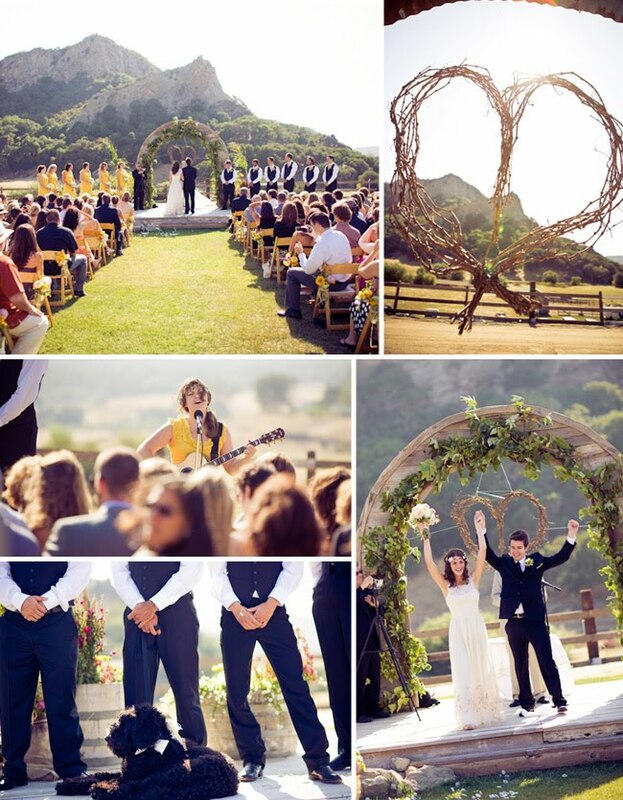 How amazing is this ceremony location? Love the setting and the beautiful heart made of vines. Their dog even joined them for this important day! Marisa really wanted some photos with the horses, so just before dinner I loaded the couple in my wagon and drove across the ranch to where the horses were grazing to see if they would let Marisa join for a few images. They were more than willing and Marisa and I were so happy! The invitations were designed by Marisa and Adam and then they had them printed at Paper Sky, a paper store in downtown San Luis Obispo. 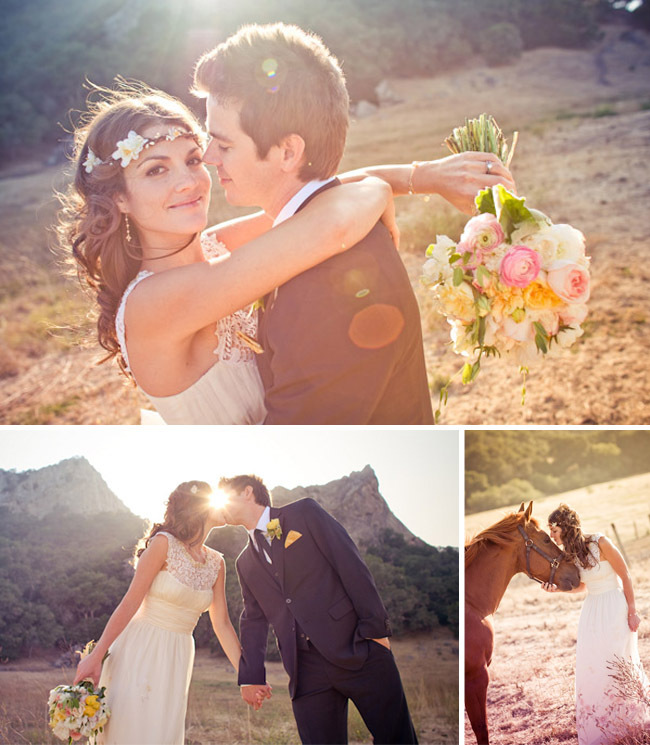 What a beautiful dreamy wedding! Thanks so much Cameron for letting me share this beautiful day with everyone and congrats to Marisa + Adam! Check out Cameron’s blog for more beautiful portrait photos and their engagement photos. Jen, you've featured two weddings of people i know and i can't thank you enough for sharing these! they look absolutely amazing and beautiful and i'm so glad i get a peek into their day! Love those bridesmaid dresses! Where are they from? Stunning! 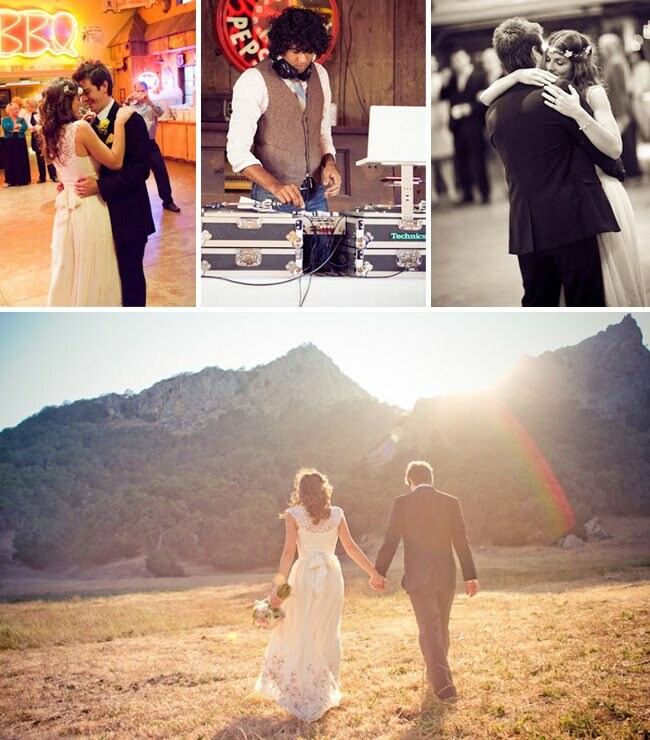 The pictures are absolutely dreamy! Wow! I love her flower crown! I've been looking for how to make one of these…anyone know how? Sweetness…. It looks sooooo beautiful! LOVE your eye for design and your ability to tell a story with imagery. I HEART Green Wedding Shoes! Yeah, my name is Marisa, my FH is Adam and we're having a yellow wedding. That creeped me out a little. Yay! This looks so awesome, thank you to Cameron who is the BEST photographer ever and Green Wedding Shoes! I am so happy that people can share in our joy. How dreamy! I am in love with this wedding. That Claire Pettibone dress is the most gorgeous dress I've ever seen. This wedding is amazing. I'm officially obsessed with her hair wreath – amazing! Love the lighting that this particular photographer is always having being part of the photo. Very delicate, natural, beautiful photography. where is the brides dress from?? it's gorgeous! whats the name of the design? gorgeous. I don't think my dog would ever be able to sit still like that. Ever. this wedding is THE JAM. just wow. i absolutely love that one of the bridesmaids sang and played guitar during the ceremony. i plan on having my sister play our processional song on the electric guitar as we flutter down the aisle. i'm all about using freindors! this wedding is absolutely gorgeous!! i love every bit of it!!!! 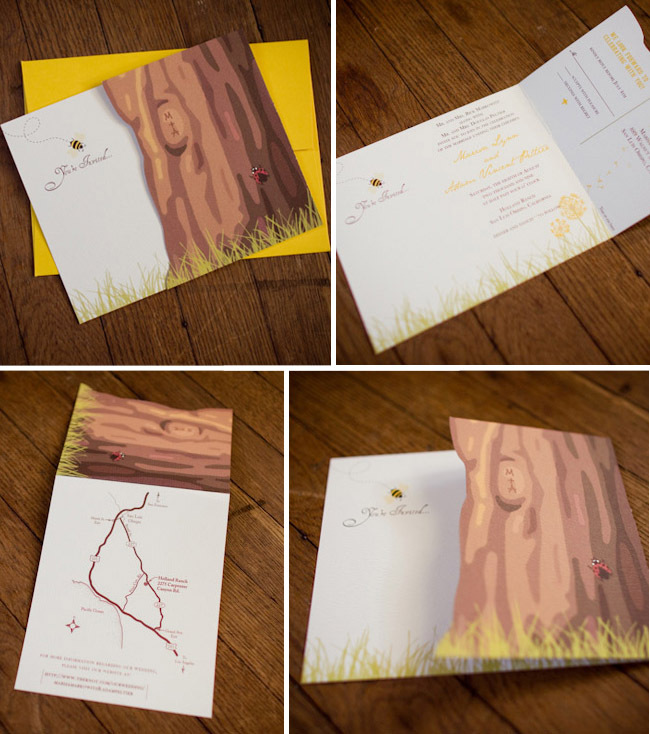 those invites are super cute…where would you get ones like them? I anticipate that we will be seeing this wedding all over the blogs… what a magical day they created. Nature meets beauty in such a great way here. 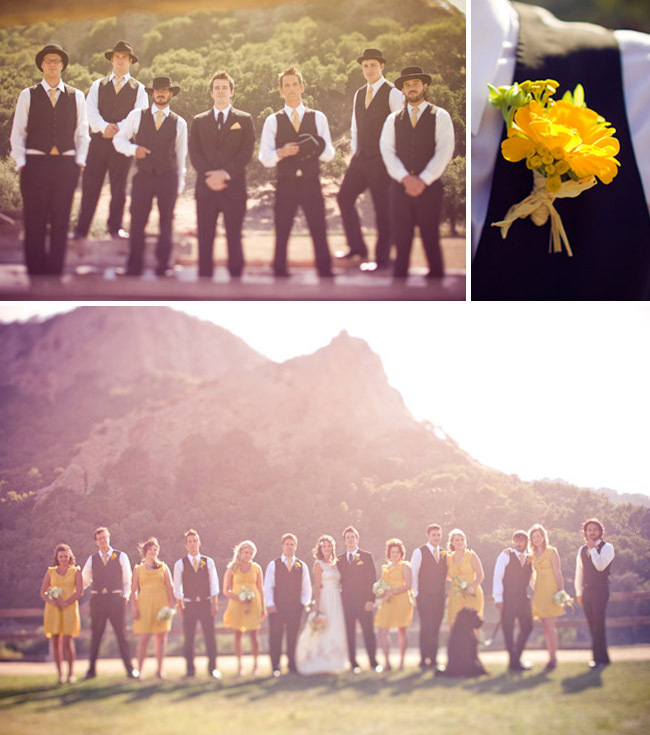 Love how this wedding came together in the photos! Oh wow! This wedding is amazingly beautiful! 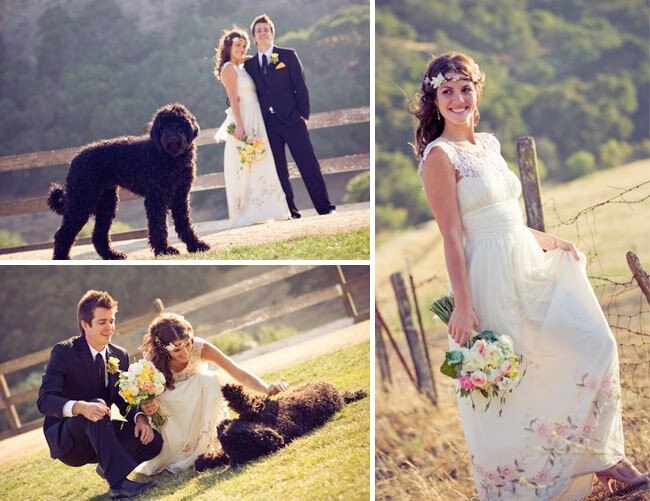 I know that the dress is Claire Pettibone from the Spring 2008 line… but what's the name? I have been searching for this dress for almost 2 years!!! Love Love Love the wedding! This was my Wedding Dress too! I was married on 11th July this year and I fell in love with a picture of this dress in a magazine but was told it had been discontinued. I emailed Claire Pettibone direct and she said she still had enough material to make one more for me! I was SO happy! It is the most amazing dress and you look beautiful. Shana: The dress is called Lucien, email the Beverly Hills brnach and speak to Cyntia Pinot. She was VERY helpful! Yes, the dres is the Lucien. My dress was the sample that they used on the runway. I don't think that they make it anymore. But yes, you should call the store in Beverly Hills! My husband and I designed the invites ourselves from our home computer and had them printed at Paper Sky, a paper store in downtown SLO. I made my own favors (just bought the bags online and made the tags) and Piccolo Cupcakes did my cupcakes. She is a friend of mine but has a small business, if you are interested I can give you her phone number. where are the bridesmaid dresses from? i love them! 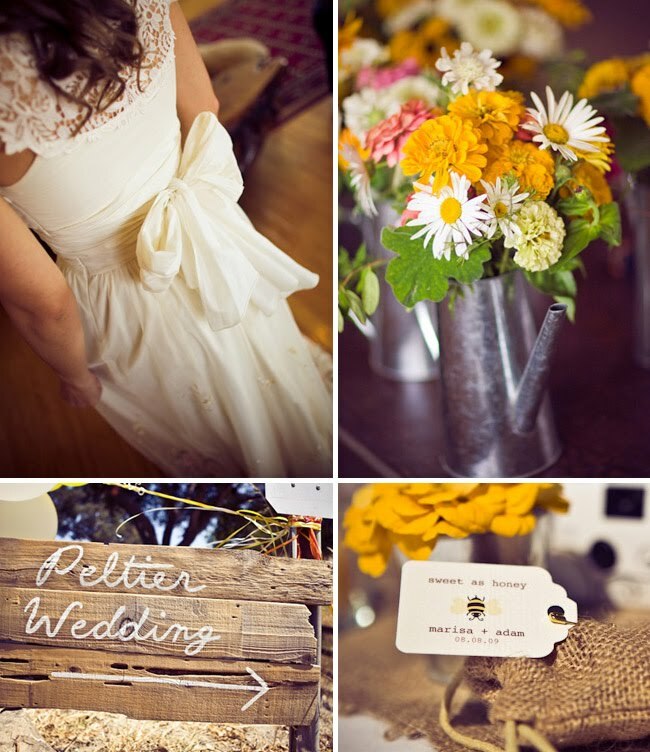 I adore these images and just love the dress and yellows! love her dress. what a charming wedding! Wow wow wow! So gorgeous! 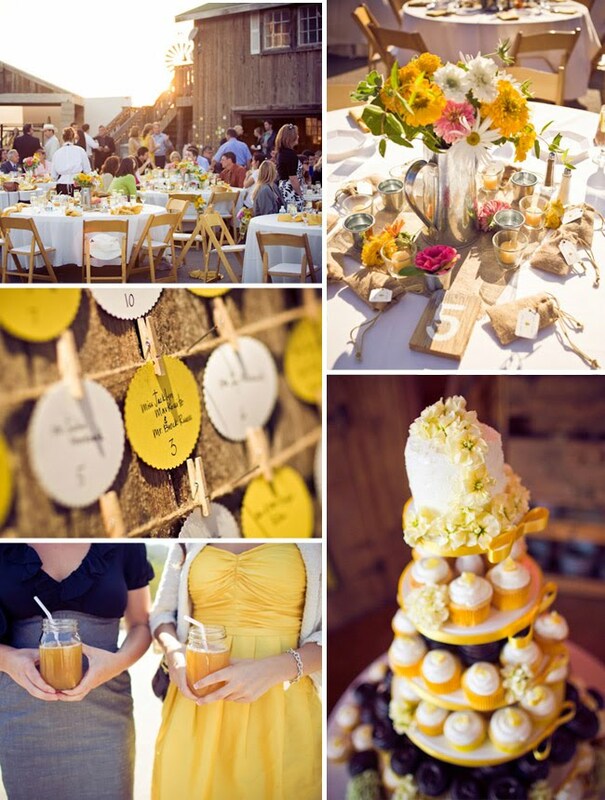 Definitely one of the most fabulous weddings I have seen in a while! Love it all! Hi, Marisa and Jennifer, I too am wondering if either of you would sell your wedding dress. Or even rent it if you dont want to give it up. I am so sad that the designer isnt making them again, and I cannot think of a dress that even compares to it. Does anyone think if I cant find this dress if a seamstress would be able to replicate it? Such a magical wedding! I love how they incorporated horses and their dogs into their photos. So sweet. It ties in with the back to nature theme so well! Hi! This wedding is amazing! I would like to know where can I find the bride’s dress designer o website? Thanks, my best wishes for the couple.